SoundTransit is a collaborative, online community dedicated to field recording and phonography. 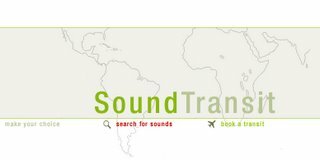 On this site, you can plan a sonic journey through various locations recorded around the world, or you can search the database for specific sounds by different artists from certain places. If you are a phonographer, you can also contribute your recordings for others to enjoy. The Creative Commons Attribution License encourages the sharing and reuse of all sounds on this website.